An Advertise Local Rep will contact you to get started and answer your questions. New customers are calling, are you ready to answer? 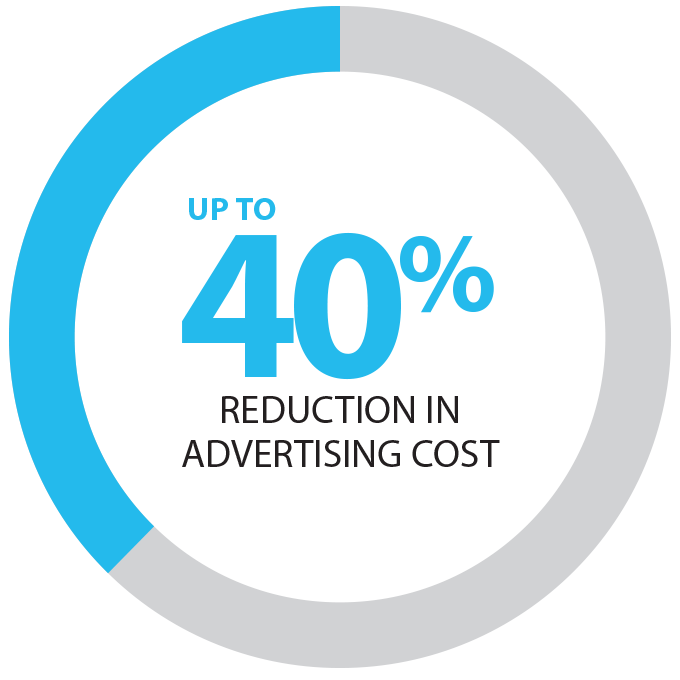 Advertise Local will reduce your online advertising cost. Our artificial intelligence software technology adjusts your campaigns 24/7 ensuring you’ll never overspend on wasted clicks. Advertise Local will create a mobile AdWords campaign and capture page tailored for your industry. No more figuring out complicated websites and online marketing. Spend more time growing your business. Today, more local searches take place on mobile devices than on computers. Advertise Local finds customers in their ready to buy, call, or book a service moments and makes it easy for them to take action. 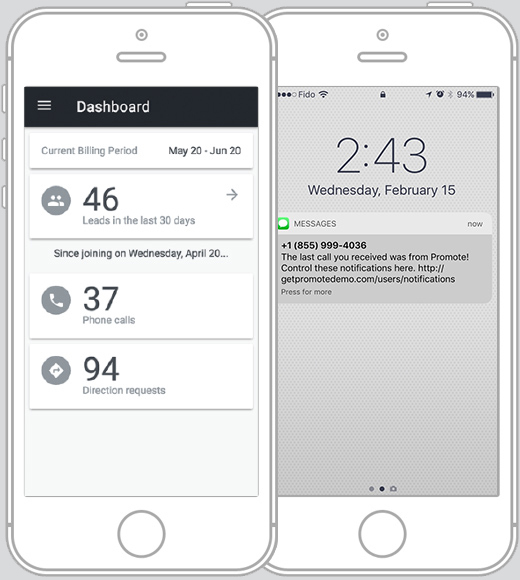 Unlike typical advertising, our ‘call tracking and reporting' shows you in real-time exactly how many phone calls your ads are getting, giving you the confidence your marketing budget is being well spent. 1Where will my ad show up online? 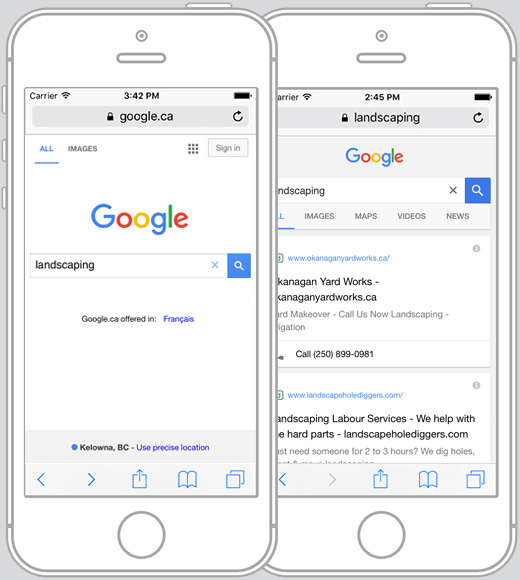 Your ads will show next to Google search results on mobile phones when people search for your products or services. 2What’s the difference between Advertise Local and Google Adwords? 3What is the difference between ‘SEO’ and Advertise Local? SEO has very little to do with Advertise Local. For any term that customers search for on Google, the top result on the page receives about 34% of the traffic for that term. The second results receives 18% and it quickly gets much worse from there. Having your website appear on top of these ‘organic’ results require years of investment in quality content, picking the right keywords, following Google’s guidelines and so on. This is “Search Engine Optimization” (SEO) and requires constant vigilance to maintain top ranking. Many businesses hire SEO expert consultants to assist in improving their website rankings. Advertise Local side-steps SEO and that entire costly and time-consuming process by creating ‘pay-per-click’ PPC ads on Google, appearing alongside these 'organic’ results. 1Do I need a website to use Advertise Local? No. Whether you have an existing website, Google+ My Business page, Facebook Business Page, or no website at all, you’ll need a place where your advertising can link to. We create a mobile capture page where customers will land after they click your ad. If you have an existing website or domain name, Our capture page won’t interfere or interact with it at all. These mobile optimized pages are designed to convert the traffic we send to them, work on any device or browser and are easily customized to your business, providing a ‘call to action’ that directs customers to click to instantly call you. 2Why is a Google Partner status so important? Advertise Local is a Google Partner. This means we have been approved by Google, passing their high standards of performance, security and reliability with flying colours. It’s hard to know these days whether an advertising tool or agency is a trusted leader or fly-by-night operation. With a Google Partner you can be assured we’re one of the best. 3How is Advertise Local different from Digital Marketing Agencies or PPC Tools? Unlike the human-managed services of digital marketing agencies or “do it yourself” online tools, Advertise Local is powered by artificial intelligence. With a few simple details about your business and your budget limits, Our software automates the optimization of your advertising campaigns. It continuously makes impossibly smart decisions and requires no time to monitor and control, while providing 100% transparent results about whether your ad dollars are driving new business. You’ll have nothing to manage, except how to serve the higher volume qualified customers calling your business! Advertise Local is a spin-off company of BUZZ Marketing Agency. After years of building websites and running online advertising for local businesses we developed a solution that makes online advertising easy and profitable for small businesses with modest budgets.